"We shouldn't be here…" Netflix has released the official trailer for an indie horror film titled The Ritual, which premiered at the Toronto Film Festival last year. This horror is about a group of college friends that reunite for a camping trip in the forest, but encounter a menacing presence in the woods that's stalking them. It seems to play with the idea that "your darkest dreams await you" out there, thanks to whatever this creepy "ritual" from the title is. The main cast of The Ritual includes Rafe Spall, Robert James-Collier, Arsher Ali, and Sam Troughton. Featuring a score by Ben Lovett. I feel as if we've recently seen tons of these kind of forest/camping horror thrillers, so I'm not sure what this one offers that's new. Check this out. Reuniting after the tragic death of their best mate, four old friends from university set out to hike through the Scandinavian wilderness. But a wrong turn leads them into the dark and mysterious forests of Norse legend, where an ancient evil still exists and stalks them at every turn. 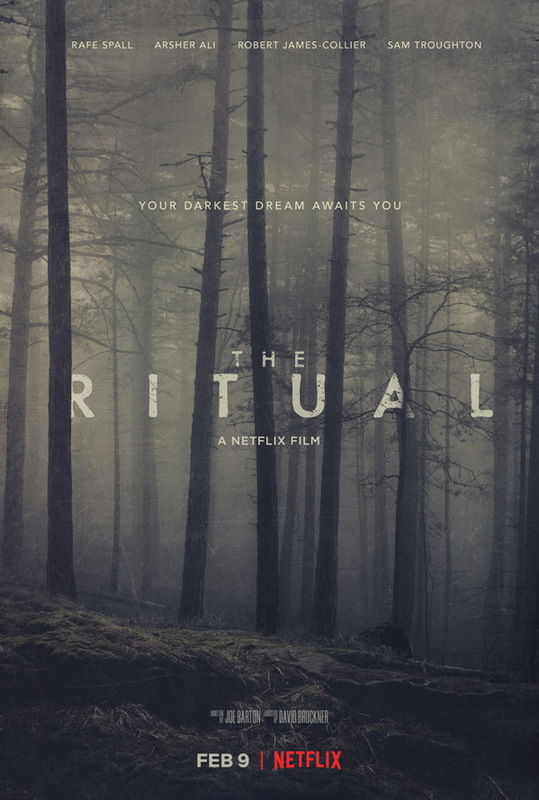 The Ritual is directed by American filmmaker David Bruckner, director of segments in the horror films Southbound, V/H/S, and The Signal previously, now making his solo debut. The screenplay is written by Joe Barton, adapted from Adam Nevill's novel of the same name. This first premiered at the Toronto Film Festival last year. Netflix will be releasing Bruckner's The Ritual streaming exclusively starting February 9th this winter. Who wants to see this film?